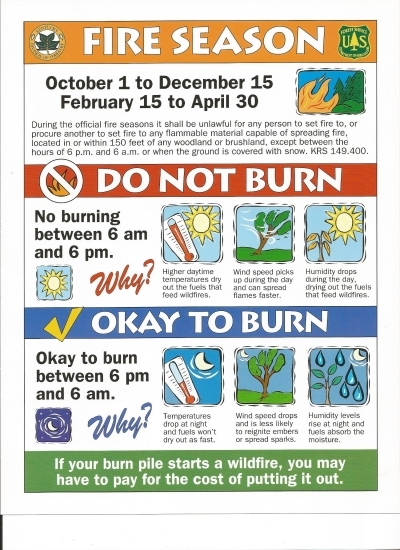 The periods commencing on February 15th and ending on April 30th and commencing on October 1st and ending on December 15th of each year are hereby declared to be and established as the fire hazard seasons. 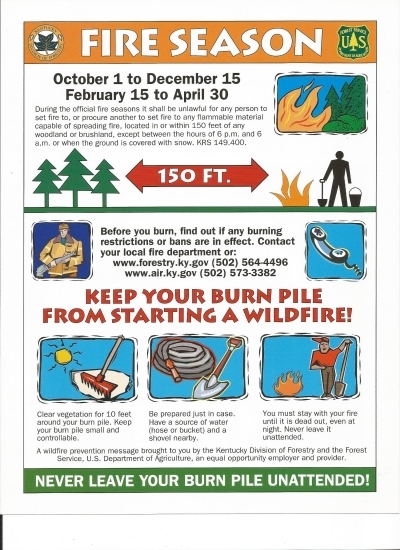 During the fire hazard seasons it is unlawful for any person to set fire to any flammable material capable of spreading fire, located in or within one hundred fifty feet (150') of any woodland or brushland, except between the hours of 6:00 p.m. and 6:00 a.m.
Congrats to Greg Osborne(left) being named as Betsy Layne Fire Department Firefighter of the Year for 2018. Greg had 132 training hours in 2018 and is always around the station when he is not at work. 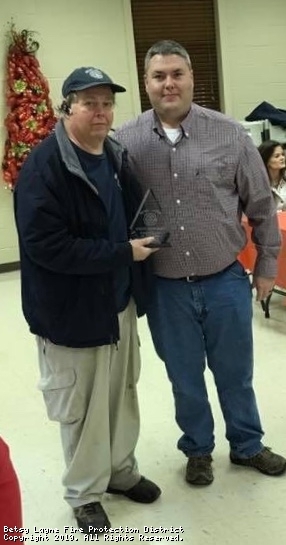 Presented by Bobby Slone(right) at our annual fire department Christmas Dinner. Congrats G.O. and keep up the great work you deserved it! WHERE EXACTLY IS BETSY LAYNE AND HOW DID IT COME TO BE? The city of Betsy Layne, Kentucky, was named for Elizabeth Johns Layne (the wife of Tandy Middleton Layne known by many by her nickname of 'Betsy') who was one of the first settlers of present-day, nearby Justell sometime after the year 1831. It is located in the far eastern portion of Floyd County approximately 1 1/2 miles north of the Pike County line. In the summer of the year 1947, Betsy Layne High School Agriculture Teacher Earl Hays and a group of his friends came together to form the 'Betsy Layne Mens' Club' and one of its goals was to establish local fire protection for the citizens of the area. In 1976, several years after a volunteer fire company had been established, the now-defunct Mens' Club would be incorporated into the Betsy Layne Volunteer Fire Department. In 1984 (after several months of hard work and determination on part of the firefighters and also consideration of the Floyd County Fiscal Court) the department's current tax protection district was established and the organization came to be known as the Betsy Layne Fire Protection District, a name it still holds even today. Six years after this amazing feat, the group was honored with receiving a Class 4 ISO rating becoming the first strictly volunteer fire department east of the Mississippi River to accomplish such a task. In 1994 (47 years after the volunteer fire company had first been organized) the group and the community endured the loss of their first civilian in a house fire within the area. Within just a few years afterwards, four more civilians would perish in three additional structure fires within the Betsy Layne Fire Protection District but, still, we went on. Currently, the Betsy Layne Fire Protection District owns and operates six different fire apparatuses out of its six-bay two-story block and brick building and they include three Pierce pumper engines, one Ford rescue vehicle, one Pierce ladder truck, and one Chevrolet personnel transportation vehicle. Individually listed below, 24 active firefighters, and 5 active non-firefighter board members serve this community on a daily basis. Their years of service range anywhere from an excess of 40 years to only a few months. No matter their age or experience, every member has their own job to allow the organization to run like a well-oiled machine. Betsy Layne is and always will be about constant teamwork and dedication to one another and, like our Chief often says, "there is no I in Betsy Layne". The Betsy Layne Fire Protection District serves all of Betsy Layne, Harold, Stanville, Tram, and Little Mud Creek as well as portions of Ivel, Prater Creek, and Boldman. To read more about this organization, you may do so by clicking on either the 'ABOUT US' or 'HISTORY OF BLFD' segments to the far left of this page. You may also read more about each member by simply clicking on the 'MEMBERS' section, too. This site has been viewed 490,160 times.